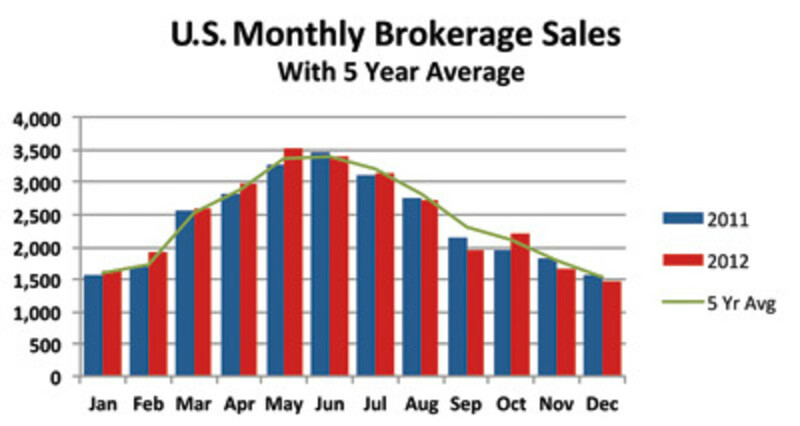 U.S. brokerage sales were up strongly for much of 2012, compared with the previous year, but slower sales in the fall limited the market’s gains for the year. According to YachtWorld member brokerages reporting in SoldBoats.com, their proprietary database, 29,444 boats changed hands during the year, a 2 percent increase from the 28,748 that were sold in 2011. The aggregate value of the boats sold was $3.26 billion, down $67 million, or 2 percent, from the previous year. Weaker sales of larger, more expensive vessels was the principal reason for the decline, although sales of large yachts improved in the fourth quarter, which brought the aggregate price for all sales significantly closer to 2011’s total by the close of the year. The most dramatic example of the fourth-quarter trend occurred in December. Unit sales were 6 percent lower than in 2011, at 1,479 boats sold — the lowest sales volume for the month since 2008. Yet the total value of those sales was up 83 percent, to $352.3 million, a better valuation for the month than in any of the previous five Decembers by some $50 million. Although sailboat sales rode a roller coaster throughout the year, they finished about the same as in 2011, with 5,449 boats sold. The value of the boats sold declined year over year by 3 percent, to $414.7 million, and the average number of days needed to sell a boat increased by 1 percent, to 298. In contrast, powerboat sales were 3 percent higher than in 2011, with 23,995 boats sold, and the average time to sell declined by 11 days, to 257. The aggregate price paid was $2.85 billion, down from $2.9 billion, a 2 percent fall. The 2012 growth in unit sales can be chiefly attributed to small and mid-size powerboats, with the number of sold boats under 26 feet increasing 6 percent, to 9,422, and the number of boats sold between 36 and 45 feet up 3 percent, to 6,144. Boats between 26 and 35 feet sold at the same rate as in 2011, with 11,407 transactions. Among larger boats, particularly those longer than 56 feet, the number of transactions was about the same as in the previous year, but the aggregate price fell by more than $100 million. In the size category 56 to 79 feet, unit sales were up 4 percent, with 729 boats sold, but the aggregate price paid declined 7 percent, from $557.1 million to $520.7 million. Among boats 80 feet and longer, unit sales were down 4 percent, with 157 sold, and the total value dropped 6 percent, from $761.6 million to $713.6 million.